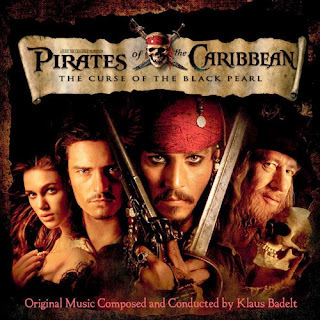 Snippets of Jack: "He's A Pirate"
As if running a blog about the The Pirates of the Caribbean weren't nerdy enough, I now listen to the sound track music! It's actually loads of fun! Play it anywhere you go and you feel like you are actually in the movies. 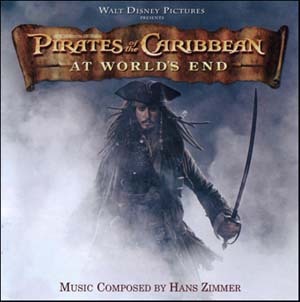 Right now, I only have the soundtracks to Pirates of the Caribbean: Curse of the Black Pearl and At Worlds End. I have listened to the whole album thuroughly and I will get the other two albums, or at least some of the songs soon. The first sound track has fifteen songs, some of which are as short as a minute and half or up to almost five minutes. The At Worlds End soundtrack has more of a variety. While it's only thirteen songs, the shortest is a minute and a half and the longest is almost eleven minutes! And yes, I have to admit I've listened to them all. DOn't judge until you've actually listened to them, because they are really cool! So you should really buy them. I don't know how many of you actually buy your songs legally off iTunes or wherever like I do, but if you are a punk and dowload them illgally, you should really make an excpetion for this. This stuff is really worth paying money for. 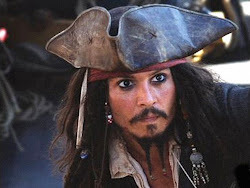 Plus, wouldn't you agree the people who make the Pirates of the Caribbean deserve it? Just buy the whole album and you'll save money like I did! Now, since I haven't listened to all of the music just yet, it would be rather dificult for me to tell you which songs are my favorite. So an official favorite list will be posted later, but in the mean time I'll share with you which songs have stood out to me. The cool thing about the soundtracks is that you hear certain parts and you can just totally tell where in the movie it comes from. When you've seen the movies as many times as I have (which is doubtful unless you run a blog too, in which case you should totally share about with me), you can almost quote the scene! For example, the first song of the first soundtrack is called "Fog Bound". There is a part where you can totally just imagine Elizabeth looking through the fog and seeing the Black Pearl and finding Will's body. Also, the next song, "The Medallion Calls" which I am actually listening to right now, there is a certain part where you just know that the gret Captain Jack Sparrow is sailing triumphantly in his little row boat. The music is so magnetic and admittedly epic because it just sounds like Jack! Then the tone completely shifts to a solemn yet honorable tone when Jack sails by the hanged pirates and lowers his hat in honor. Don't beleive me? Then listen for it yourself. Also, throughout the soundtrack you hear the super dramatic music that is usually played during some dramatic scene between Will and Elizabeth. There is also the super classic just epically awesome music that plays during the credits. It's kind of like the theme song. If you were to recongize any of the music, it would be this one. It's called "He's A Pirate". It is one of my favorite just because it is so energetic and happy. Whenever I hear it I think of all of Jack's totally epic sword fights. Okay, now we are jumping to the third movie soundtrack. It's not that I didn't like the second, but the msuic didn't strike me as as epic as the first and third. It's starts out with "Hoist the Colors". If you weren't aware, that's the name of the song that the prisoners who are about to be executed sing in the very opening song. It starts out with the little kid singing and then they all join in until they hang. It's a bit creepy because it actually has words. The little kid on death row is singing, and you here the rattling of their chains. Pretty intense. Then there is "Singapore", which doens't have any words, but you can still just tell right away that they are in Singapore (even if you didn't read the name of the song). I actually like this soundtrack more than the first. If you've read some of my other posts regrading the Parlay scene later in the movie, you'd know about what I think of the music that plays when Jack, Will, Elizabeth, Beckett, Jones, and Barbossa all walk along the side bank: It's like rock music! That's in the song "Parlay", which cracks me up every time. Two songs later is "What Shall We Die For" is my all time favorite. It's during the time when Elizabeth presents her speech to the Brethren Court and they all join together. It is actually so epic. You can hear all the pirates cheering in unison and you just know that they are going to kill it. I must admit, certain parts give me chills, that's how nerdy I am. The song after it is also pretty epic, "I Don't Think Now's the Best Time". It's while they are fighting my favorite battle! Now go buy the soundtracks if you haven't already and report back to here with your opinions? Am I a nerd? Am I correct? Am I both?